Pardon me for starting the post off-topic, but last night I went to a talk given by Richard Noble the director of Bloodhound SSC (below), aiming to achieve Mach 1.4 or 1000 mph (~1600km/h ). I freely admit it was an inspiring talk and especially given how little I knew from the small excerpts produced by IMechE - UK's institute for Mechanical Engineering, it provided to be very informative. Why I raise this, is that one of the key emphases on the talk is about inspiring the next generation of Engineers not just in the UK but all over the world - akin to Nasa's Moon Landing Programme in the 60's. We share a responsibility as engineers to foster the development of the youth. Many open design such Raspberry Pi and Adruino are sharing such successes involving children and young adults alike. Without becoming too philosophical, FreeCAD would be part of this idealistic goal. Being able to provide free but importantly open tools that I never had when I was at school would bring opportunities I wouldn't have dreamt off - I was the one of the last generation at our school to produce hand-drawn drawings, which shockingly was only six years ago. Ultimately if you cannot contribute to FreeCAD as a programmer, there are endless ways you could help and I wish to thank the members of our community for doing so without initiative! Probably the biggest changes came last night and was most surprisingly because of the fact how tired I was. The Drawing View (QGraphicsView) updates itself when you change it's property, this includes dimensions too and surprisingly works very well. Additionally the drawings are correctly created when you restore a document. Hopefully I'll publish a video to better demonstrate this, because find it a satisfying result. The other changes is scale independent rendering, edges retain the same stroke width regardless of the document zoom.All this we get for (nearly) free in QGraphicsView! There's a problem with selection at the minute, but hopefully will be sorted out soon (Fixed). I don't believe this is easily done using SVG because transformations are applied at object level. The example of above scales as you would expect, which was scaled really small on my screen but is not desirable in CAD drawings. 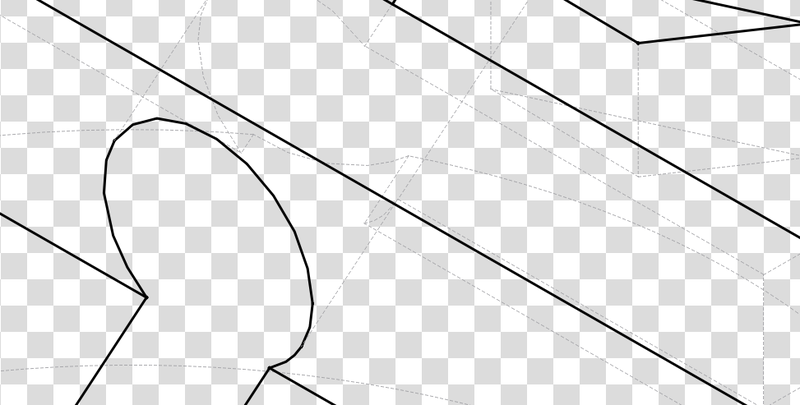 You don't want lines to obscure each other when you zoom in, especially on an extremely complicated part with greater detail such as below. I've also added a scale option. This currently transforms the original FreeCAD Part, however, I am still unsure is the best approach in terms of performance which could be natively applied in the projection algorithm. However, now it appears to work correctly. In the previous drawing module the scale was applied at the presentation layer in SVG and wasn't really the best solution although it worked. I wanted to put a picture up but I am currently upgrading Kubuntu. It will most likely not go smoothly, but atleast I'll be ready to report any problems compiling with FreeCAD. Taken a short screen cast to show off the Drawing Module in it's current state. Only had 15 minutes to make it this morning, so sorry for the lack of quality! Note: The drawing artefacts appear when recording the video for some reason but otherwise are not there normally.